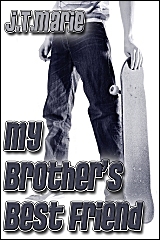 My latest e-book release is My Brother’s Best Friend, a young adult short story about a teenage girl with a crush on … you guessed it! Her brother’s best friend. There was a time not too long ago when I would’ve thought I’d never write a non-gay story again. Granted, this story doesn’t quite fit, since there are gay characters in it, but the main character through whom the story is told is not gay. This story came to me quite suddenly one night while lying in bed, trying to get to sleep. I get a lot of ideas that way, which is why I have a notebook on my bedside table with story ideas jotted down on it that I hope to write one day. This one came to me in a rush, and when I took a writing class at the Visual Arts Center here in Richmond over the summer, I wrote this piece to hand out in class. I had a page limit and didn’t quite finish the story for class, but wrapped it up after the class was over and violà! A new J.T. Marie story! Amber has had a fierce crush on Nate, her brother Bryan’s best friend, since she was nine years old. Now that she’s almost old enough to date, she knows who she wants her first boyfriend to be. Unfortunately, Nate doesn’t really talk to her, and Bryan won’t set them up. Then Amber finds out why.